Backreaction: Get your protons right! So a meson is an anti-quark? Thanks for pointing out that the phrasing was ambiguous, I have fixed that. The Trump Administration has instructed Fermilab to redefine the color charges as red, white and blue. "The protons and neutrons are themselves made of three quarks each, held together by gluons"
I thought the numbers of quarks in protons and neutrons were modulo 3, not exactly 3, but multiples of 3. In the eye of the beholder. I see a “fat Y” not a filled in “delta”. 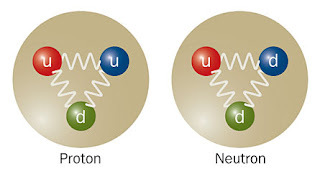 This might be a dumb question, but as I understand it, protons and neutrons appear from the outside to be more or less spherical. However the diagram configuration of three quarks in a triangle is very much less symmetrical than a sphere - it is essentially two dimensional. 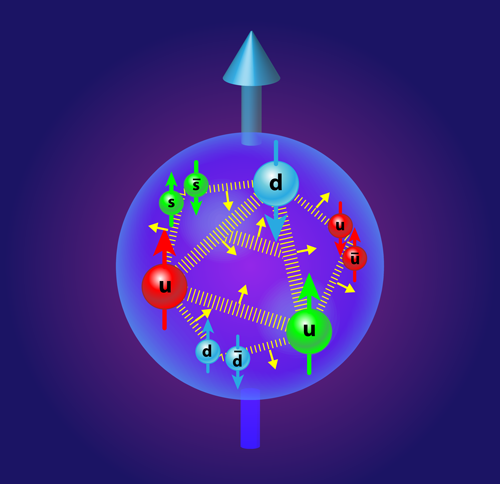 So why do protons and neutrons appear to be spherical? It's three valence quarks. In addition there are an in principle infinite amount of quark-antiquark pairs. I don't know why you think the total should divide by 3. The quarks can move around and they turn into any direction because none is preferred, so on the average it's spherically symmetric. Hello Dr. H. So if meson a quark/anti-quark pair why would they be held (together/apart?) by a gluon and not just annihilate each other? How are the textbooks depicting the flux tubes? Quarks are on average equilateral triangle vertices. Gluon binding flux is a Y, arms' far ends pinned to their quarks' centers. Arms' mutual intersection is in the plane at the centroid, oscillation amplitude above and below the triangle's plane maximum at the centroid. Yes? Question: A) Are the Y’s three ends locked pointing at their quarks’ centers, Y oscillation having a mirror plane of symmetry, or 2) Can the Y rotate versus the vertices, along the edges, rotation axis through the centroid and normal to the plane, and perhaps counter-rotating versus the other side? Counter-rotating half-Ys might cyclically define and disperse the vertices, the centroid remaining fixed where the nucleon "is." I'm afraid to say I rather think it's none of the above. So if the nucleon were in a magnetic field would we (usefully?) picture it's precession due to its composite magnetic moment to be along the vertical stem of the gluon Y? We would then lose the spherical isotropic picture that the 2-d picture in no field does not fully reflect. These lattice studies still involve special assumptions and approximations, so I am going to cling for a while longer to the T-shaped or I-shaped model of the proton as quark and diquark connected by a flux tube (which is the Y-shaped model, but with the three-way join and two of the quarks all clustered at one end)... 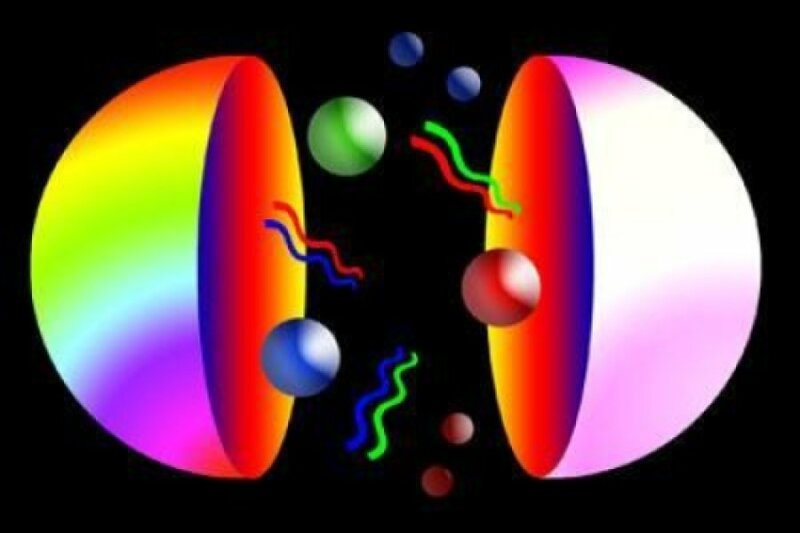 I think the best *picture* is Christine Davies' Kandinsky proton, since it conveys the difference between valence quarks and the other partons. Could you please comment on how & why the rest-mass of a proton or neutron orginates? IIRC, adding up the mass of the quarks does _not_ even come close to accounting for the proton or neutron mass. In most mesons the quarks and antiquarks are not of the same flavor, so they are not their own antiparticles. If the quarks and antiquarks are mutual antiparticles (as for the neutral pion for example), they do annihilate. This means these particles have a very short lifetime, but it still makes sense to use them in calculations. Unknown: I wrote about this here. Thanks for the link to the animation, this is cool! The strong force has to get weaker for large enough distances, otherwise the quarks on earth would interact incredibly strongly with the quarks at the end of the universe. Is it possible to compute at what distance the interaction is strongest, and to compute analytically or computationally, the force as a function of distance? I suppose there is no simple closed-formed formula like the inverse square law of gravitation and electromagnetism, or it would be all over the blogs already! But please tell us. 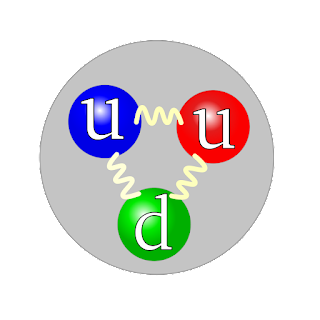 If the string contains enough energy to create a quark-antiquark pair, it will rip, so that the initial particle decays into two particles. "If the string contains enough energy to create a quark-antiquark pair, it will rip, so that the initial particle decays into two particles." Thanks! Is this something that has been observed experimentally? Thanks for the nice article! Is this Y-shape flux-tube structure consistent with the Lund string model, i.e. modeled by a Y-shaped string instead of a line-shaped string, and is there any experimental implication, such as polarization or spin correlation in pp-collision or fixed-target experiment, that can be measured to differentiate the Y-model from the Delta-model? I thought quarks also have an electric charge. How much does that account for in their interaction? Also, is color charge quantized like the electric charge? 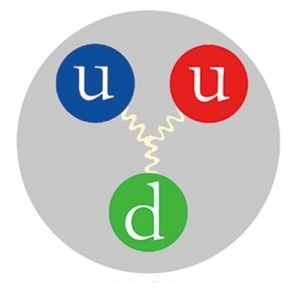 For the neutron: Doesn't the small EDM mean that quarks have to be arranged along a line (d-u-d) ? Well, yes, you see this every time a neutron decays. You don't see the string itself of course, that's just a computational device. I don't see why this would not be consistent with the Lund model. I don't know any prediction that comes from the Y-shape in particular. But these calculations may go on to inform the distribution of quarks in protons and these do in principle enter the prediction for pp-collisions. But whether you can extract this from the data I don't know. This is nuclear physics, very low energy compared to the LHC. The strong force is strong indeed in this case. I don't think the electric charge makes much of a difference in this regime, but to be honest I don't know much about lattice calculations. Not sure why you think so but I strongly doubt this makes sense - this configuration seems highly energetically disfavored. Thanks for yet another enlightening blog-post. I am puzzled, though, by "However, this triangular [...] configuration cannot connect three quarks and still maintain gauge-invariance". For if "gauge-invariance" refers to SU(3) gauge invariance, then how can any spatial arrangement break gauge invariance when local SU(3) gauge symmetry is an internal symmetry. Am I being stupid, or what? Thank you Dr., that clears it up.. Thanks for the interesting post! Btw, if the preferred configuration is Y-shaped, does that mean that all three quarks are attracted towards the junction in the Y and not towards each other? Thanks for your prompt reply and bringing up this interesting topic. It seems like the difference between these two models might have some impacts on the parton distribution functions, particularly those of gluons and virtual quark-antiquark pairs inside the baryon, as you mentioned that the strings would be more stretched in the Y-model than in the Delta-model. So in principle this can be probed by DIS cross section measurements such as electron-proton scattering experiments. It would be really nice if we can probe the transition between Y-model and Delta-model as brought up by Thomas (By the way, the latest measurement on proton radius should be around 0.87 fm, so 0.5 fm is still smaller than the size of a proton, I guess?) as a function of quark separation or baryon size using both lighter mesons and heavier baryons such as Lambda's/Sigma's or even tetraquarks/pentaquarks (if we can keep them long enough from decaying?) and compare the results with predictions from lattice calculations. If you have a nucleus, is it right to think of it as consisting of individual protons and neutrons, or is it more like one big blob of interacting quarks? That is, do the individual nucleons keep their identity when they form a nucleus? I'm wondering because of analogy with something like the chemical bonds in benzene. I don't think of a particular electron as belonging to a particular atom, or of there being distinct single and double bonds. Instead there's just a big blob of interacting electrons. What I mean is this. While lattice calculations inform pdfs, and this is a lattice calculation, I don't see how this calculation (as with the Y-shape opposed to Delta) would directly enter the pdf and give rise to a measurable difference. You can think of them as protons and neutrons. I'd say each quark is attracted to both of the remaining ones, but I guess it's a matter of language. No, the flux-tubes are not fermionic. @Sabine: Thanks. Without the intention to enter into any detailed discussion, which I am not really qualified to undertake, as I have little to no experience with Wilson loops, I would like to make a single comment regarding the paper you link to: Eq. (3) for B_Delta is not even an SU(3) scalar because the indices do not match, i.e., properly contract; in fact, Eq. (3) should strictly speaking, I believe, be written with the left-hand side carrying six lower indices. That alone is sufficient to conclude that the configuration is not SU(3) gauge invariant; no need to perform any explicit SU(3) transformation to check that, as the authors suggest. Right? Thanks. I have two questions. 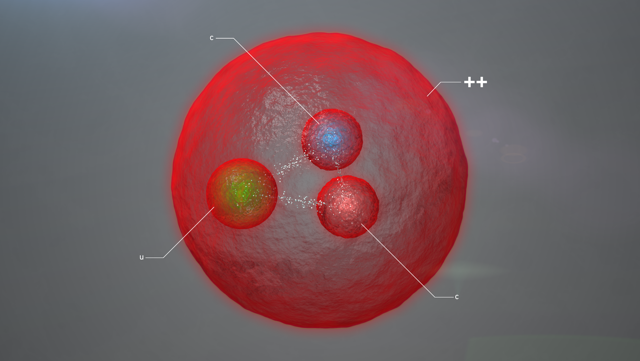 What is a quark size? Is proton structure has a influance for efficiency of collision in LHC? I well remember, while visiting friends in San Francisco, purchasing two paperback volumes from a Sausalito bookstore. Each contained a collection of articles from prior issues of the Scientific American magazine. That was about 1990 or 1991. One volume was titled: "Particles and Forces At the Heart of the Matter", and had a smorgasbord of articles relating to particle physics. I more or less cut my teeth on understanding the Strong interaction from reading these articles, one of which was titled "Quarks with Color and Flavor" by the well known physicist Sheldon Lee Glashow. Not even the spectacular views out the window could distract me from reading as the bus trundled its way over the Golden Gate back to the city. Much water has flowed under the bridge of science since that article by Sheldon Glashow was written in 1975. But I believe the foundational principles of Quantum Chromodynamics have remained much the same since that time. Does anyone really believe a quark is a quark before it is measured? Or does anyone believe a gluon will be a gluon before it is measured? brings to mind the three phase delta and wye circuits of the electrician. Have they been experimentally detected, or are they just a necessary ingredient for SM to stick? Gluons are necessary to arrive at the correct predictions. Prof. Wilczek comments the artwork in his book "A beautiful question", but compare the diplomas of his fellow awardees, David J. Gross and H. David Politzer! Yes, gluons have been experimentally observed. In the TPC experiment at SLAC (e+ e- at 29 GeV) where I did my dissertation, the detected charged particles (electrons, muons, pions, kaons, and protons) tend to look like they're grouped into "jets", each jet from one parton (i.e. a gluon or quark). Most events have 2 back-to-back jets, one each from the original quark and anti-quark (produced by the virtual photon from the electron-positron annihilation). But some events clearly have 3 jets, where the third jet is an energetic gluon radiated by the original quark or anti-quark. The number of third jets and their energy and angular distributions match that predicted by perturbative QCD (Feynman Diagrams, not lattice calculations). As the collision energy increases, the grouping of particles into jets becomes more pronounced. At the high energies of hadron colliders, jets are quite distinct and everywhere. Gluons are the source of some of the jets observed there, and their presence is again necessary for QCD to match what is seen experimentally. As far as physicists can tell, quarks and gluons are point particles. The number of the highest energy jets at hadron colliders is sensitive to the presence of quark substructure, equivalent to saying that quarks have a finite size and are not point particles. Whenever a new energy regime is explored, one of the first physics papers is a measurement of the jet energy distribution, the result being stricter limits on quark substructure. Before physicists can have any confidence in measurements of top, Z, W, Higgs, and other goodies, they have to be able to demonstrate they accurately model the number and energies of the background jets. These models are based on perturbative QCD and necessarily include gluons. Nothing exotic. Just good bread-and-butter physics. Hok Chuen mentions the Lund string model, a fascinating phenomenological flux-tube model of "hadronization", the process where quarks and gluons become hadrons (mesons and baryons). In this model, perturbative QCD is used to create high-energy quarks and gluons, at high enough energies where the effective strong force coupling constant, alpha-sub-s, is small enough for perturbative QCD to be tractable and non-perturbative effects small. As mentioned in this discussion thread, alpha-sub-s increases as the amount of energy decreases, and in the regime where hadronization occurs, perturbative QCD is not tractable and non-perturbative effects become large. The Lund model bridges the gap between high energy partons and observed hadrons. The model connects the partons with color flux tubes with a constant energy density per unit length. Quarks have one color or anti-color, so they terminate the ends of the flux tubes. Gluons have a color and an anti-color, so they join two flux tubes together. The connected partons are moving apart, so the connecting flux tubes grow longer, stealing energy from the partons. Left alone, the flux tubes would steal all of the energy of the partons, but it is also possible to pop from the vacuum one or more quark-antiquark pairs along the flux tube so that these new quarks break the flux tube into pieces and terminate the new ends of the flux tube pieces. The broken flux tube pieces are shorter than the original flux tube, so they have less mass-energy. Being energetically favorable, and quantum mechanics being what it is, the model iteratively creates quarks that break the original flux tube into pieces until the mass-energy of the pieces fall below a threshold, and the pieces become hadrons. When one quark/antiquark pair is popped, mesons are formed. When two quark/antiquark pairs are popped, baryons are formed. This model is implemented by the Monte Carlo simulations Pythia (hadron colliders) and Jetset (electron-positron colliders) used in physics analyses.